Saturday, May 10th I saw an Orange-crowned Warbler at work while I waited for an afternoon group to arrive. While down at the lake teaching canoing a Ruby-throated Hummingbird whizzed over the kids heads while I explained strokes. That was my first hummingbird of 2008. I could hear ovenbirds as well but didn't see them. 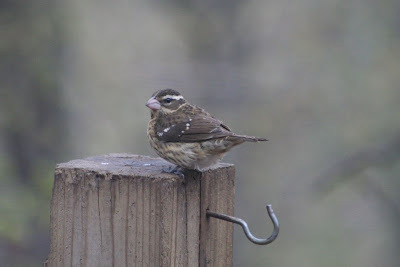 Sunday was mother's day and I saw my first House Finch of the year at their feeders. Returning home that evening I heard the first chimney swifts of the year as I got out of the car and quickly looked up to catch of glimpse of them. Today, Tuesday May 13th seemed like a pretty dreary day but it wasn't too bad for birds and I didn't even leave the building! 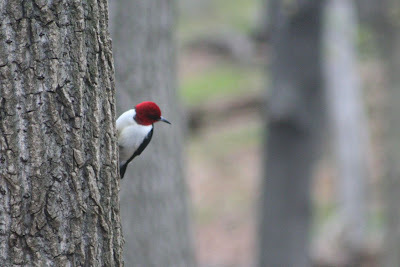 While I worked on 2008-2009 schedules I could see birds flitting around in a maple tree out my office window. I looked though my binoculars and they were Nashville Warblers. A beautiful yellow bellied sapsucker landed in the same tree while I watched. I looked again a few hours later and I'm glad I did. The birds I saw later were Tennessee Warblers! That's a first of the year for me! Woo hoo. A while later I was curious if anyone had recorded Tennessee Warbers on our bird tally at work. I strolled into the classroom and looked out the window at the feeders. Wow, there were a lot of birds in the drizzly rain. There were nuthatches, and lots of beautiful American goldfinches, ohh there's the Baltimore Oriole and a Rose-breasted Grosbeak and . . . what's that on the ground? Holy sh*t! 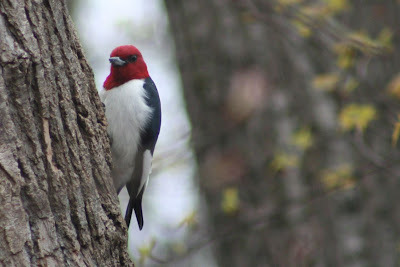 I ran full speed across the building, flung open the office doors and shouted "RED HEADED WOODPECKER!!!" while I grabbed my new SLR camera off my desk. Everyone in the office poured out behind me as we ran across the building and then slowed as we approached the windows. It was still there! Some of my co-workers had never seen on in their lives so it was really fun. While I shot photos, a number of turkeys showed up too. 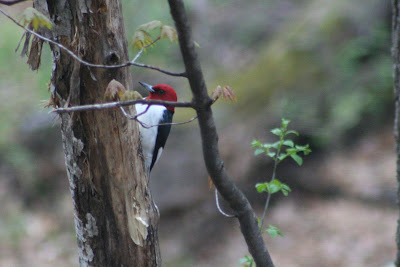 I haven't seen a Red-headed Woodpecker at Warner in six years. There was one there my first year but they haven't been around since then. He was having a grand old time with the trees so hopefully he'll stick around all summer and nest. I shot a lot of photos but the lighting conditions were horrible. The shots look better if you click on them to view the larger sized images. 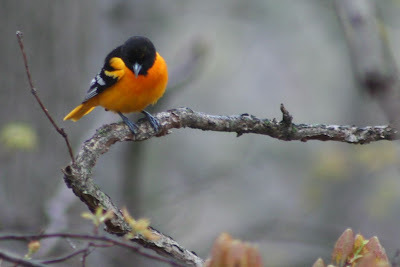 I threw in a shot of the Baltimore Oriole I really like and the female Rose-breasted Grosbeak as well. Enjoy! While driving home I also saw an indigo bunting which was a first of the year for me. Sorry, no photo. I saw it for about half a second.